This article describes how you can add additional functionality to RadPdfViewer – a context menu. The below snippet is an example of a context menu implemented through the RadContextMenu control. To be shown in the area where RadPdfViewer is you have to set it as a content of the viewer. Every RadMenuItem in the RadContextMenu is bound to a RadPdfViewer command through a CommandDescriptor. Additionally, you can easily add a custom menu item to the context menu by binding it to a custom command descriptors. More on how to create command descriptors you can find here. 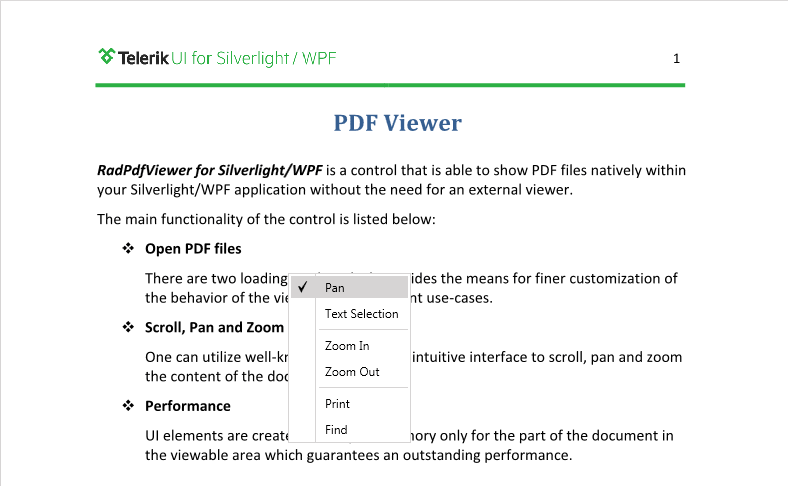 You can download a runnable project of the previous example from our online SDK repository here, the example is listed as PdfViewer / ContextMenu.